National Infrastructure Bank: What's the Deal? 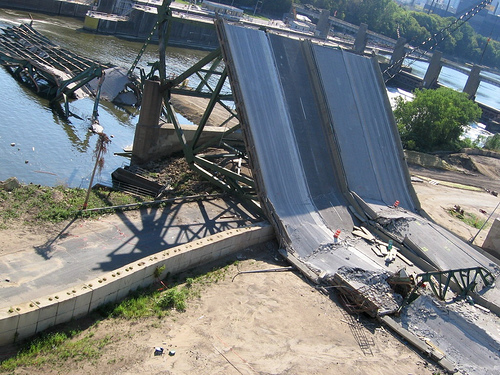 The collapse of the I-35 W Mississippi Bridge in Minneapolis in August 2007 coincided with Senators Dodd and Hagel submitting the National Infrastructure Bank Act. Photo by intersubjectiv. The NIB would be a federal financial entity designed to promote a more efficient level and mix of infrastructure investments by creating a funding mechanism outside the normal budgeting process. Since it is widely agreed upon that America’s transportation system is in need of modernization, and since transportation investment constitutes over 70% of current federal infrastructure investment, this proposal has serious implications for transportation planning (though some supporters advocate for a bank that also finances housing, energy, telecommunications, water, and other infrastructure). Various versions of an NIB have been proposed — by President Obama, Senators Chris Dodd (D-Connecticut) and Chuck Hagel (R-Nebraska), Representative Rosa DeLauro (D-Connecticut) and others — but these are similar in a few key respects. Most proposals allow the bank to offer direct subsidies, loans and loan guarantees. Some allow it to purchase infrastructure-related debt and equity securities issued by public and private entities, such as project-specific bonds (DeLauro 2009) . The resulting loans would be repaid by the borrower (state/local governments or private entities), who would likely receive revenue from fees levied on users of the infrastructure or general tax revenue. The NIB would operate as a relatively independent agency, either a wholly owned government corporation (like the FDIC) or an independent entity within the U.S. Department of Transportation. It would be run by directors appointed by the President and confirmed by the Senate. The bank would derive its capital from an initial injection of government funds. Most proposals allow the bank to eventually capitalize itself by issuing bonds. Page 9 of the briefing paper includes a chart summarizing each proposal. The NIB leverages private capital, allowing government to avoid raising taxes to fund transportation investments. Higher levels of infrastructure investment could then be achieved in a more politically viable way. The NIB would examine the investment returns for each proposed project, achieving a more efficient distribution of resources. With political independence comes a loss of accountability. A bank that is not reliant on Congressional appropriations is not subject to the oversight of the executive or legislative branches. This vacuum could be filled by other influences, such as special interest lobbying or the preferences of the bond market. As a bank, the NIB would strive to maximize its own returns. This could mean that governments with wealthier jurisdictions would be favored for funding, as they would be able to offer more favorable terms to the NIB. Recipients of funding may also choose to convert the economic returns from a project into revenue returns that could be promised to creditors. But this would only work for certain types of projects, i.e. a bridge that can be tolled easily, as opposed to a highway where tolling would be more complex, which could create biased project selection in favor of certain projects. The needs of private investors could hamper good transportation planning and management. For example, private investors in a road project want to be guaranteed that future changes to the system do not devalue their investment, so contracts would set a range of acceptable toll prices. This would interfere with the operator’s ability to manage demand through congestion pricing. Similarly, private investors often demand non-compete or compensation clauses, which bar or discourage adding capacity to a system if it results in less ridership on the toll road in which they have invested. Infrastructure investment is often used as a counter-cyclical economic stimulus. Government invests during recessions, providing jobs and encouraging spending. As the economy recovers, fiscal policy should recede, making room for private spending. An NIB would not necessarily jive with this counter-cyclical idea, as private capital markets become more risk-averse during recessions. Overall, it seems that a National Infrastructure Bank would address some flaws in the transportation funding system but perhaps create others. One serious question is yet to be answered. Several panelists at yesterday’s Brookings discussion on infrastructure and economic development echoed a sentiment that has been expressed by countless transportation advocates: America needs a comprehensive new transportation vision. How would a National Infrastructure Bank, driven by profit motive and free from government accountability, help us build and carry out that vision?